(HealthDay)—The ancient practice of tai chi may beat strength training and aerobics for preventing falls among seniors, a new trial shows. A modified senior-centered tai chi program reduced falls nearly a third better in a head-to-head comparison with an exercise regimen that combined aerobics, strength training and balance drills, the researchers reported. "This tai chi program better addressed the deficits that were contributing to fall risk," said senior researcher Kerri Winters-Stone, a professor with the Oregon Health & Science University School of Nursing. Tai chi is a centuries-old Chinese tradition that involves a graceful series of movements. People performing tai chi flow between different postures in a slow and focused manner, keeping their body in constant motion and frequently challenging their balance. Researchers have long suspected that tai chi can help reduce risk of falling, said co-researcher Peter Harmer, a professor of exercise and health science with Willamette University in Salem, Ore. Annually, about 28 percent of U.S. seniors report falling, and 2 out of 5 falls result in injuries leading to an ER visit, hospitalization or death, researchers said in background notes. "Falling in adults age 65 and older is significantly associated with loss of independence, premature mortality and big health care costs," Harmer said.The movements of tai chi require people to move in all directions, while traditional exercise programs focus more on forward and backward motion, Winters-Stone and Harmer said. "The reality of how falls happen tends to be quite varied and a bit unpredictable. In tai chi, the movements are in these multiple planes," Winters-Stone said. "You're moving your body outside of your center of gravity and then you're pulling it back. There's a lot of postural responses. "If you accidentally started to fall, if you had been trained in tai chi you would probably be better at starting to counteract that movement and regain your balance," Winters-Stone continued. But classical tai chi can involve upwards of 100 different movements, which can be challenging for seniors to learn, Harmer said. So, the research team for this clinical trial developed a pared-down form of tai chi that focuses on eight fundamental movements most related to fall prevention, Harmer said. The trademarked program is called Tai Ji Quan: Moving for Better Balance. To see how well the program works, researchers tested it against both a traditional exercise program and a control group that only performed stretching exercises. Researchers recruited 670 Oregonians with an average age of nearly 78 and assigned them to one of the three programs. "This was a more at-risk group than we've worked with before," based on both their age and screening for fall risk, Harmer said. After six months, the tai chi group was 58 percent less likely to have a fall than the stretching group, and the traditional exercise group was 40 percent less likely to fall than people who only stretched. Compared against each other, the tai chi program outperformed traditional exercise. People taking tai chi suffered 31 percent fewer falls than those who took strength training and aerobics courses. "Not falling is a pretty complex physiological behavior," Harmer said, noting that you combine muscle strength with feedback from muscles and joints, eyesight and even hearing to regain your balance. "Tai chi directly challenges the integration of all those things." Although tai chi did work better, people following a traditional exercise program still gain a benefit, noted Nathan LeBrasseur, a physical medicine and rehabilitation researcher with the Mayo Clinic in Rochester, Minn.
"I would not discourage people who are actively participating in a strength and aerobic exercise program to throw in the towel and say, 'Now I need to do tai chi,'" said LeBrasseur, who wasn't involved in the study. "The real challenge is getting people to adopt and stick to an exercise program." Harmer said tai chi not only improves balance, but also improves confidence. "We've found a major risk factor for people falling is fear of falling," Harmer said. "People might have had a fall. They're scared then of falling again, so they start doing fewer physical things so they don't fall. It kind of becomes a self-fulfilling prophecy." The modified tai chi program requires people to push themselves out of their comfort zone, breaking the negative cycle, Harmer said. LeBrasseur agreed that whatever the exercise, more should be asked of seniors if they want to protect their health. "I do think we tend to hold back across multiple exercise interventions in terms of really challenging and pushing older adults with the notion it will lead to harm and injury, when in fact it probably will drive beneficial adaptations," LeBrasseur said. The new study was published Sept. 10 in the journal JAMA Internal Medicine. More information: Kerri Winters-Stone, Ph.D., professor, Oregon Health & Science University School of Nursing, Portland; Peter Harmer, Ph.D., M.P.H., professor, exercise and health science, Willamette University, Salem, Ore.; Nathan LeBrasseur, Ph.D., physical medicine and rehabilitation researcher, Mayo Clinic, Rochester, Minn.; Sept. 10, 2018, JAMA Internal Medicine.The U.S. National Center for Complementary and Integrative Health has more about tai chi. Using Tai Chi to Build Strength: Tai chi moves can be easily learned and executed by people of all ages and states of health, even elderly people in wheelchairs. (The New York Times: By Jane E. Brody) Watching a group of people doing tai chi, an exercise often called “meditation in motion,” it may be hard to imagine that its slow, gentle, choreographed movements could actually make people stronger. Not only stronger mentally but stronger physically and healthier as well. I certainly was surprised by its effects on strength, but good research — and there’s been a fair amount of it by now — doesn’t lie. If you’re not ready or not able to tackle strength-training with weights, resistance bands or machines, tai chi may just be the activity that can help to increase your stamina and diminish your risk of injury that accompanies weak muscles and bones. Don’t get scared by its frequent description as an “ancient martial art.” Tai chi (and a related exercise called Qigong) does not resemble the strenuous, gravity-defying karate moves you may have seen in Jackie Chan films. Tai chi moves can be easily learned and executed by people of all ages and states of health, even those in their 90s, in wheelchairs or bedridden. It’s been eight years since I last summarized the known benefits of this time- honored form of exercise, and it has since grown in popularity in venues like Y’s, health clubs and community and senior centers. By now it is likely that millions more people have become good candidates for the help tai chi can provide to their well-being. First, a reprise of what I previously wrote as to why most of us should consider including tai chi into our routines for stronger bodies and healthier lives. It is a low-impact activity suitable for people of all ages and most states of health, including those who have long been sedentary or “hate” exercise. It is a gentle, relaxing activity that involves deep breathing but does not work up a sweat or leave you out of breath. It does not place undue stress on joints and muscles and therefore is unlikely to cause pain or injury. It requires no special equipment or outfits, only lightweight, comfortable clothing. Once proper technique is learned from a qualified instructor, it is a low-cost activity that can be practiced anywhere, anytime. One more fact: Beneficial results from tai chi are often quickly realized. Significant improvements involving a host of different conditions can be achieved within 12 weeks of tai chi exercises done for an hour at a time twice a week. Much of the research, which was reviewed in 2015 by researchers at Beijing University and Harvard Medical School, has focused on how tai chi has helped people with a variety of medical problems. It is summarized in a new book from Harvard Health Publications, “An Introduction to Tai Chi,” which includes the latest studies of healthy people whose mission was health preservation as well as people with conditions like high blood pressure, heart disease, diabetes, arthritis and osteoporosis. Of the 507 studies included in the 2015 review, 94.1 percent found positive effects of tai chi. These included 192 studies involving only healthy participants, 142 with the goal of health promotion or preservation and 50 seeking better balance or prevention of falls. This last benefit may be the most important of all, given that every 11 seconds an older adult is treated in the emergency room following a fall, and one in five falls results in a fracture, concussion or other serious injury. For example, in an analysis of high-quality studies published last year in the Journal of the American Geriatrics Society, researchers at the University of Jaen in Spain reported that older adults who did one-hour tai chi sessions one to three times a week for 12 to 26 weeks were 43 percent less likely to fall and half as likely to incur a fall-related injury. Tai chi provided superior benefits to other fall-reduction approaches like physical therapy, balance exercises, stretching, yoga or resistance training. Tai chi, in effect, combines the benefits of most of these: It strengthens the lower body, improves posture, promotes flexibility, increases a person’s awareness of where the body is in space and improves one’s ability to navigate obstacles while walking. Furthermore, if you should trip, tai chi can enhance your ability to catch yourself before you fall. It has also been shown to counter the fear of falling, which discourages people from being physically active and further increases their likelihood of falling and being injured. Even if you do fall, tai chi, as a weight-bearing but low-stress exercise, can reduce your chances of breaking a bone. Four well-designed clinical trials showed that tai chi has positive effects on bone health. For example, in a yearlong study in Hong Kong of 132 women past menopause, those practicing tai chi experienced significantly less bone loss and fewer fractures than those who remained sedentary. For people with painful joints and muscles, tai chi enhances their ability to exercise within a pain-free range of motion. Pain discourages people from moving, which makes matters worse as muscles get weaker and joints stiffer. The movements involved in tai chi minimize stress on painful areas and, by improving circulation, can foster relief and healing. A 2016 study of 204 people with knee pain from osteoarthritis found that tai chi done twice a week was just as effective as physical therapy in relieving their discomfort. But that was not all: Those doing tai chi for the 12 weeks reported that they were less depressed and had a better quality of life than those undergoing physical therapy. 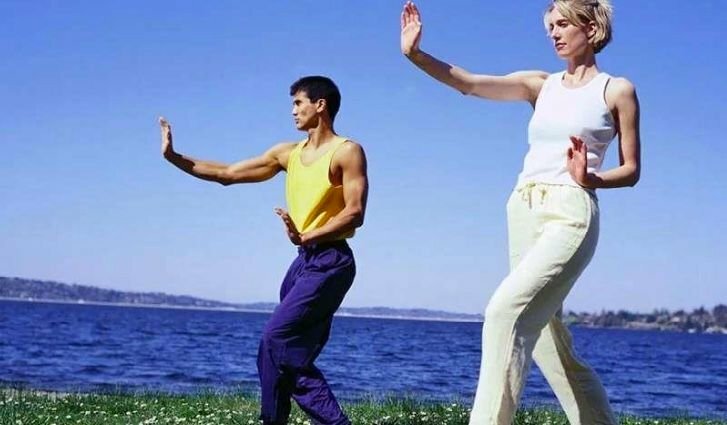 Tai chi can also be an entry point for people who may have fallen off the exercise wagon but want to get back to doing more vigorous and often more enjoyable physical activities like swimming and hiking, or biking and walking to and from errands instead of relying on vehicles that pollute the air and clog the roads. Guidelines from the American College of Sports Medicine and the American Heart Association recommend that sedentary older adults begin with balance, flexibility and strength training exercises before launching into moderate to vigorous physical activity. Tai chi is ideal for getting people ready for more demanding action. And, in the process of getting your body in shape with tai chi, you’re likely to improve your mental state. In a New Zealand study of college students, tai chi was shown to counter depression, anxiety and stress. It also enhances an important quality called self-efficacy — confidence in one’s ability to perform various activities and overcome obstacles to doing so.